Five membership levels exist in the IAVAT: active, associate, student, retired, and honorary. View the descriptions below for characteristics of each type of membership. The IAVAT's affiliation with other Career and Technical Associations at the state and national levels extends to the dues structure. Due to those affiliations, "dues packages" are offered to active, associate, and retired members. Associate membership is open to Agricultural Education staff at the university level, Agricultural Education Consultant staff at ISBE and the Executive staff at the Illinois FFA Center. Illinois Association of Community College Agriculture Instructors members may be opt to be an active or associate member of the IAVAT. Others may become Associate members by unanimous vote of the IAVAT Executive Committee. Associate members have the right to attend all meetings and participate in discussions. Associate membership dues can be paid annually or with a one-time life membership fee. Student membership is open to any student enrolled in a community college or university with the intent to pursue a career in Agricultural Education. Student members shall have the right to attend all meetings and participate in all discussions. Student dues are paid annually. Retired membership is open to former active or associate member of IAVAT who have retired completely from the profession. Retired members have the right to attend all meetings and participate in all discussions. Retired membership dues can be paid annually or with a one-time life membership fee. The member services committee is developing workshops for retiring/retired teachers during IAVAT Conference. For more information, contact the committee. Honorary membership is open to individuals interested in Agricultural Education and is a typically and honor bestowed on those that have provided lengthy or extraordinary service to Agricultural Education or the profession. Honorary membership can only be granted by a majority vote of the Board of Directors present at any regular meeting. Honorary members have the right to attend all meetings and participate in all discussions. There are no dues for honorary membership. Illinois Association for Career and Technical Education (IACTE): The IACTE is a state association for those who teach and administer career and technical education. 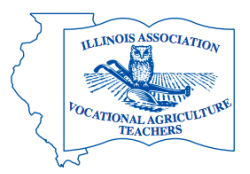 The organization has a broader focus than agricultural education, it serves teachers and administrators in all career and technical education areas by focusing on marketing career and technical education, developing the professional leadership skills of its members; assists in career and technical education curriculum development, impacts state policies and legislation, and creates networking opportunities for members. Association for Career and Technical Education (ACTE): The ACTE the largest national education association dedicated to the advancement of education that prepares youth and adults for careers. ACTE works to enhance the job performance and satisfaction of its members; increase public awareness and appreciation for career and technical programs; and assures growth in local, state and federal funding for these programs by communicating and working with legislators and government leaders. National Association of Agricultural Educators (NAAE): The NAAE is a federation of state agricultural educators associations with more than 7,650 members. Currently NAAE is focusing on three areas - advocacy for agricultural education, professional development for agricultural educators, and recruitment and retention of current agricultural educators. Illinois Association of Community College Agriculture Instructors (IACCAI): The IACCAI is a state association for community college instructors of the agriculture industry. Its primary objective is to promote the interest of education in agriculture in the State of Illinois. For membership or dues structure questions, please fill out the form below.